The election results from the East Boston Chamber of Commerce are in. BOSTON – New England Patriots wide receiver Matthew Slater and running back Kevin Faulk will visit East Boston High School on Friday (Dec. 9) to educate students about healthy teen relationships and how to prevent teen relationship violence, as a part of Verizon’s Training Camps for Life initiative. Some 400 students are expected to attend. WHO: Slater and Faulk will speak as will retired Patriot and East Boston High School alumnus Jermaine Wiggins; and retired Washington Redskin Pete Kendall, a football standout at Boston College. They will be joined by Willis Whalen, manager of player services of the NFL Players Association; Ted Bunch, co-founder of A CALL TO MEN, an organization committed to ending violence against women; and Verizon’s Donna Cupelo. WHAT: Training Camps for Life is a half-day, NFL-star-studded event addressing topics suc as overcoming adversity, decisions and consequences, and healthy teen relationships. At the end of the event, Slater will lead the students in taking the LIVERESPECT pledge, a commitment to end teen relationship violence and speak out against abuse. Training Camps for Life is a partnership between the National Football League Players Association, A CALL TO MEN and the Verizon Foundation. WHEN: Friday, Dec. 9; 2:30 p.m. – 5:30 p.m.; Full agenda available upon request. NFL players and others will be available for interviews after they speak. Media contacts/RSVP: Phil Santoro, Verizon; 617-743-4760; philip.g.santoro@verizon.com. This just in from the EB Chamber of Commerce. All East Boston Chamber of Commerce members in good standing as of November 15, 2011, are eligible to vote. Good standing requires that members be current on their membership dues. Each member business of the Chamber is allowed one vote; however, Chamber by laws stipulate that any member who joined the Chamber after August 31 of the current year shall not be entitled to vote in this election; voting by multiple representatives of the same business is not allowed. Proxy voting and absentee voting are not allowed. All voting results will be counted and reported after 5:30 pm on Thursday, December 15, 2011, at the Chamber office; results will then be made available on the Chamber website and by phone call request as well. A nominations committee is selected each year and is responsible for identifying candidates for the board of directors. This year, several members of the Chamber were recognized by the committee and invited as candidates, including: Citizen’s Bank, Meridian Insurance, First Priority, Cordano Real Estate, East Boston Community Development Corporation (CDC), Neighborhood of Affordable Housing (NOAH) , and Piers Park Sailing Center. As of the response deadline, November 10, four of these members, Michael Sulprizio of East Boston CDC Board of Directors, Robert Martin of the Piers Park Sailing Center, Pedro Cordano of Cordano Real Estate and Phil Giffee of NOAH, replied that they were able to accept candidacy for board service at this time. Any other eligible candidates seeking to run for the four open Board positions are invited to run through the process for independent nomination outlined below. According to the by-laws of the East Boston Chamber of Commerce, any member of the Corporation that has been in good standing for a minimum of one year as of January 2010 may run for office by Independent Nomination. To be placed on the ballot for Director, independent nominees must obtain the signatures of at least ten (10) members of the corporation and forward them to the Chamber Secretary, Joanna Cataldo, East Boston Neighborhood Health Center, 175 McClellan Highway, no less than 10 days prior to the day of elections on December 15, 2011. Independent nominees for any of the Officer positions must meet the above requirements as well as have been a member of the Board of Directors for at least two of the previous five years. If you have questions regarding nominations, elections, or responsibilities of board directors, please contact Eden Smith, Executive Assistant of the East Boston Chamber, at (617) 569-5000. For most part at-large status quo reigns in East Boston too. With the exception of Michael Flaherty's fourth place finish in East Boston, the election results in Ward 1 were very similar to the citywide totals for the four winning candidates. Ayanna Pressley who topped the ticket citywide finished fight in East Boston. On Tuesday November 15, 2011 East Boston Main Streets will hold its annual meeting and it is open to the public. (East Boston, MA. November 4, 2011) East Boston Main Streets will host its annual meeting on Tuesday November 15, 2011 from 9:00 AM to 1:00 PM at the Main Street office; 146 Maverick Street East Boston. Board members will be on hand to answer questions and provide information on the activities and events the organization is sponsoring. All members are encouraged to attend. For more information call 617.561.1044 or visit www.ebmainstreets.com. East Boston -- East Boston High School (EBHS) will retire the numbers of former NFL player Jermaine Wiggins (18) and retired football coach John Sousa (66) on Friday, November 4 at Sartori Stadium when the EBHS Jets host The English High School. The following letter was sent to eastboston.com from the office of State Representative Carlo Basile early today. 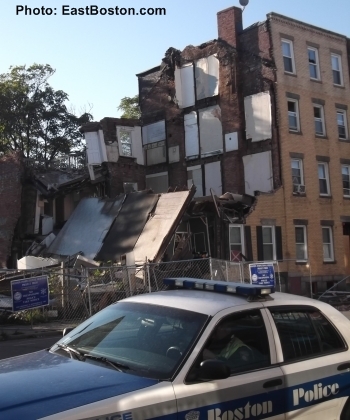 On behalf of Mayor Thomas M. Menino, Senator Anthony Petruccelli, Representative Carlo Basile, and City Councilor Sal LaMattina, we express our gratitude for the support shown to the victims of the Chelsea Street building collapse. In total, 70 individuals were displaced and the residents of 45 Chelsea Street were left with only the clothing they wore while being evacuated. Thanks to the financial support of our community, the families at 45 Chelsea Street each received over $4,000 to help replace their clothes, furniture, beds, and other belongings. The remaining money collected is being distributed to the families of 53, 43, and 41-39 Chelsea in the form of gift cards. This extraordinary outpouring of financial support—nearly $17,000 in cash or gift cards—is a testament to the strength of our East Boston community. We especially want to thank the individuals and businesses that dug deep into their pockets to help these families, including: Richard Goldberg of Logan Communications; Richard Gavegnano of East Boston Savings Bank; John Zirpolo of Cora Electric; the Fields Family Foundation of Suffolk Downs; the East Boston Neighborhood Health Center; and McGladrey Inc.
We also want to thank all the businesses that stepped up to feed the displaced families including: Kelley’s Square Pub; Great Chef Chinese Food; Goody’s Catering; Italian Express Pizzeria; Meridian Food Market; and La Hacienda. Additionally, we want to thank DJ Chris Fiore and Balloon City for generously providing music and balloons at the fundraiser for the displaced residents. Finally, we want to thank the owner of 43 and 41-39 Chelsea Street, Jim Zarella, for going beyond his responsibilities as a landlord to house his tenants at a hotel for one week and for helping each of them to find new apartments. It is said that in times of crisis, you can see the true character of a community. We are proud that East Boston has shown itself generous and resilient during this challenging time. Steve Jobs is dead at 56, Apple Computer is reporting. "Apple has lost a visionary and creative genius, and the world has lost an amazing human being. Those of us that have been fortunate enough to know and work with Steve have lost a dear friend and an inspiring mentor. Steve leaves behind a company that only he could have built, and his spirit will forever be the foundation of Apple." There will never be another Steve Jobs. The man invented the idea of creative drive. He will be missed. State Sen. Sonia Chang-Diaz has filed an amendment to the Senate version of the casino bill that would require that all of the voters of a municipality will have a say. In the case of a Boston proposal, that would give us a chance to have a voice in whether our city welcomes a casino or not. The senator has got it right. All Boston residents deserve a right to have a say in whether or not resort-style gambling sets up shop in our backyard. Read the entire editorial from the Dorchester Reporter. What do you think? This email arrived today from Susan Van Tuyl, a resident of Maverick Square. As a resident of Maverick Square I am sending you this notice as to the change in use of Taco-Mex. Taco-Mex located at 65-67 Maverick Square, is applying for an entertainment license. Given the history of the owner's previous venue with an entertainment license in Orient Heights (involving police and numerous arrests), this is not, in my opinion, the best thing for Maverick Square, especially neighboring residences. Those of us that front on the Square already have to deal with the noise generated by Eddie C's. Having entertainment on this side of the Square - directly below our windows - can only add to the disturbance. The Owner of Taco-Mex has stated that the entertainment will only be one classical guitar. But that detail has been omitted from the petition to the Board of Appeal. The hearing is scheduled at City Hall on September 20th, at 10:30 a.m. If you have an opinion on this matter; if you have a concern, either for or against - just showing up at the hearing will have little or no affect - by then approval will be a done deal. Opinions must be voiced to the Commission in advance. The telephone number is 617-635-4775. I will try to find an e-mail address. ZUMIX 5K Run to the Beat ! Lace ’em up — let’s run. Sunday, September 18, 9 a.m.
Come experience the race hundreds raved about last year – the second annual ZUMIX Run to the Beat 5K. Once again, we’re running for ZUMIX, one of the city’s beloved music and arts nonprofits. We’ll start and finish in East Boston’s magnificent Piers Park, which offers expansive views of our city’s historic skyline and harbor that can only be described as … stunning. In between, enjoy our flat, fast course along Eastie’s wooded Greenway and two magnificent new parks. We’ve got prizes for the fastest runners, live music along the course, free food, and plenty of other goodies, T-shirts for runners and giveaways. Whether you’re running for time, fitness, charity, or all of the above, you won’t want to miss this fun-filled event. EBMS Kindergarten Parade a success! Eastboston.com is honoring Labor Day by taking a few hard-earned days off. Coverage of local issues and news will resume on Sunday, September 4. Have a safe holiday weekend. The Boston Business Journal lauds as one of its "Champions in Health Care"
The city of Boston has long been a leader in providing world-class health care, but back in the early 1970s residents of East Boston hardly benefited from the city’s medical reputation. 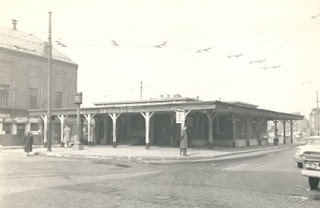 The neighborhood lacked primary care doctors, and its isolated location with limited access to the rest of Boston meant residents sometimes had to travel up to two hours via public transportation for treatment. Community members wanted something better and envisioned a facility that would serve the area’s diverse population without sacrificing quality. Their efforts led to the creation in 1970 of the East Boston Neighborhood Health Center. Dr. James O. Taylor worked with the first board of directors to help launch the center. John P. Cradock joined the center in 1978 as the administrative director. Their leadership has helped the EBNHC become a cornerstone of the East Boston community as well as a model for the delivery of health care services, all while providing a wide range of health-related services that have expanded dramatically during the past four decades. Taylor and Cradock came to the health center with a passion for serving the underserved. For those of us who remember the old relief station on Porter Street as the only place to get health care quickly, the EB Neighborhood Health Center was a great gift when it was established in 1970. Thank you Dr. Taylor and Mr. Cradock! Salesian Boys & Girls Club: The After-School Program begins September 19, 2011. The club is open Monday to Friday from 2:30 to 9:00 for ages 9 to 19 and 2:30 to 6:00 for ages 6 to 8. See the Calendar for schedules during school breaks and holidays. Please see the applications here or download an application from http://www.salesianclub.com/index.html. Father Patrick Diver, S.D.B. (1943-2011) former director of St. Dominic Savio High School has died. Mayor Thomas M. Menino and Boston Centers for Youth & Families (BCYF) invite Boston youth to meet players and coaches from the Boston Red Sox organization and compete in a baseball skills session at the annual Red Sox Talks/Fenway Challenge on Tuesday, July 26th at East Boston Stadium in East Boston. Hosted by Boston Centers for Youth & Families in conjunction with the Boston Parks Department, the Sox Talks/Fenway Challenges are sponsored by the Boston Red Sox and the Boston Police Activities League. Registration begins at 9:30 a.m. followed by the Fenway Challenge, a skills competition in running, hitting and throwing for boys and girls ages 7-14. At the completion of the Fenway Challenge around 12:30 p.m., members of the Red Sox organization will arrive and work one-on-one with each young person on their batting and pitching skills. It’s always a surprise who will show up, but there are usually several players, members of the coaching staff and others. The winners of each Fenway Challenge competition will receive two tickets to a Red Sox game in September and will be recognized on the field before the game. Camps and summer programs are welcome to attend. Please contact mike.devlin@cityofbostongov to reserve a spot. The protesters, who had anticipated the move by the cardinal, promised today to continue their fight. “Each of the six parish groups is ready to take this issue all the way to the Vatican’s highest court,” said Peter Borre of the Council of Parishes, a lay Catholic group that has contested church closings in the archdiocese. In addition to St. Frances, the churches affected by the cardinal’s decree, effective Monday, are St. James the Great, in Wellesley; St. Jeanne D’Arc, in Lowell; Star of the Sea, in Quincy; Our Lady of Lourdes, in Revere; and Our Lady of Mount Carmel, in East Boston. 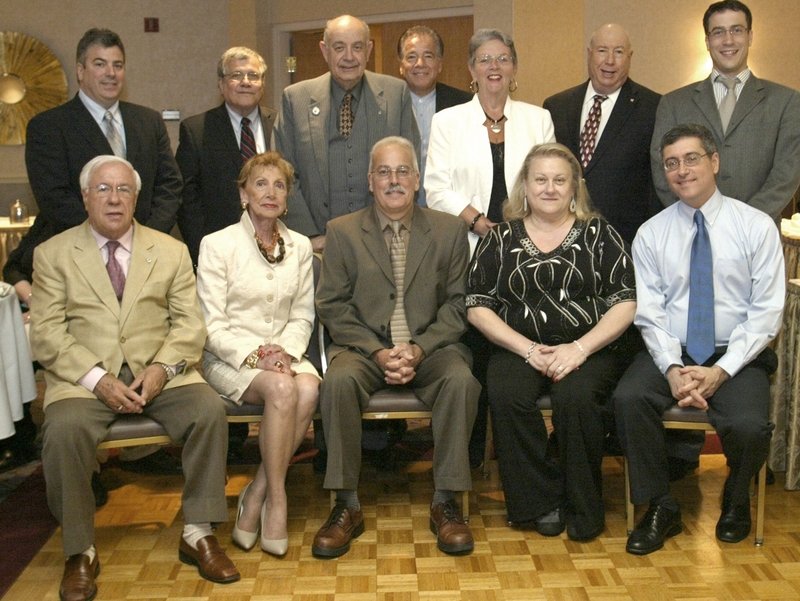 The officers and board members of the Bay State Chapter of Freedoms Foundation for the 2011-12 season are (seated, l-r) Lino Rullo, Francine D’Andrea, President Joseph Ferrino Jr., Marisa DiPietro and Past President Ed Coletta, and (standing, l-r) Richard Ferrino, Sal Bramante, Buddy Mangini, Ron Vecchia, Barbara Survillas, Philip Salois, and Riccardo Rullo. Do you care that Governor Patrick, Senate President Therese Murray, and your own Speaker of the House Robert DeLeo are right now planning closed-door negotiations to finalize a bill to expand gambling in the Commonwealth – and more importantly, likely in your own neighborhoods – within the next several weeks? Do you care to know the economic and social costs this new legislation would have on your neighborhood – on you, your family, your friends, and your small businesses? Do you care that your community’s elected presence on Beacon Hill is not actively and wholeheartedly fighting for a current, comprehensive, and independent analysis of all potential costs and benefits related to such a bill? Do you care that they are happy to rely on outdated and overly generous revenue and job-creation figures? Do you care that over the last several years, they have been wooed over and over by casino owners, lobbyists, and other proponents, via political contributions and other means? Do you care that your state elected officials may not have your best interests at heart, that they may rather follow blindly their Beacon Hill leadership than represent the interests of you, their constituents, who put them in office? Do you care to believe they may stand more to gain than you will? Do you care that if such a bill is agreed upon and signed into law in the next few weeks, that Suffolk Downs racecourse will surely secure a casino license and immediately start on a course of grand construction? Do you care that you have heard very little or nothing from your elected officials, business organizations, and the casino owners themselves concerning how your communities’ small businesses will avoid being cannibalized by a massive casino complex in your neighborhoods? Do you care that your elected officials and local newspapers have shared little to nothing with you concerning the increased levels of various crimes, insurance fraud, credit card abuse, bankruptcies, domestic abuse, child abuse, divorce, drug and alcohol abuse, and of course problem gambling, which you are sure to expect following a casino development? Do you care that those you should be able to trust most are neglecting to share with you the complete picture? Do you care that if you were shown the whole picture, expanded gambling in Massachusetts – especially in your neighborhood – would simply not make fiscal or socially-responsible sense? If you DO CARE, now is the time to act. Unless you call, write, or email your state Senators and Representatives right now – and copy the Governor, Senate President, House Speaker, and Senator Karen Spilka on your sentiments – they will help set you, your family, friends, neighbors and small businesses on an irreversible crash-course with disaster. If you DO CARE, visit United to Stop Slots in Mass. at www.uss-mass.org to find sample letters, elected officials’ contact information, and thousands of actual, proven, and documented (Read: not just moral, but more importantly financial and social) reasons to oppose expanded gambling in Massachusetts. Also visit www.neighborsofsuffolkdowns.org. Share your opinion with elected officials, local news media, and your family, friends, neighbors, and co-workers. It is time to care and to act. “Now, we must all fear evil men. But there is another kind of evil which we must fear most, and that is the indifference of good men.” Please, do not remain indifferent. Editor's Note: This letter came from "Honest Truth" to eastboston.com on June 23, 2011. 2011 Kiwanis Senior Picnic: Registration for August 10 event will take place at the Social Centers on July 10. 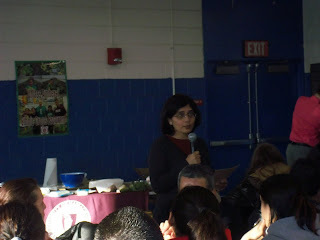 Eastboston.com has a few photographs from last week's annual Salesian breakfast. Read about it on Eastboston.com! 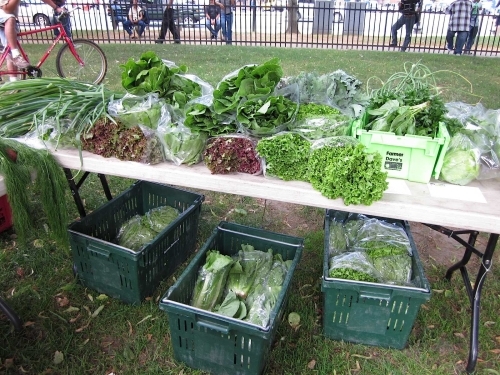 Local Veggies come to East Boston Corner Stores! The Farm to Store project’s first delivery will be on Tuesday, June 21. Recipe collection, community workshops, volunteer work days, and healthy incentive programs are all components of the Healthy on the Block program. To get involved or just learn more, contact Cait at vandammc@ebnhc.org or call 617-568-4028. To read more about the Farm to Store project visit eastboston.com. Get the full agenda at eastboston.com! MIT planning students have done their homework. They were all ears on how best to scope out the future for MainStreets. 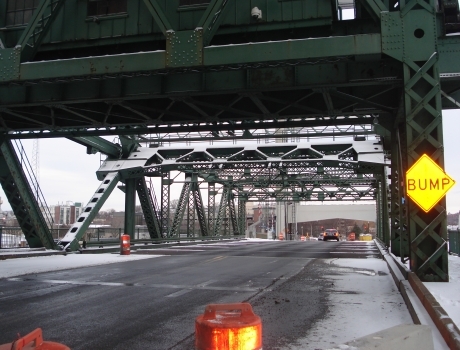 Next week they'll be presenting at three stakeholder meetings in East Boston. Advance: Mark your calendars for NOAH's 'Trinity Treasures"
NOAH's 'Trinity Treasures' Event on June 22. More information is available at eastboston.com. Volunteers are welcome. Met Bayou Street near Fort Banks School Athletic Field. Park at the Belle Isle Cemetery near the Gorman-Ft. Banks School. EB Community Food Workshops “Stir a Memory” a huge success! EAST BOSTON: Can you say “pupusa”!? Over 170 people gathered at the Harborside Community Center this past Thursday to celebrate food heritage at the “Stir a Memory” Community Food Series Workshop, sponsored by the East Boston Neighborhood Health Center. An evening filled with art, food, and lots of chatter over memories, neighborhoods and health, this was one pupusa-sharing experience that feels sure to stick in everyone’s memory! The cards quickly transformed individual experiences into a spontaneous public art project on a cafeteria wall, and sparked lots of chatting about yummy times gone-by! "That’s what was neat about Stir a Memory," said Cait Van Damm, co-coordinator of the series. "The conversations that arise around our cultural and physical connection to food, whether that be in the context of a kitchen, a neighborhood, or faraway home. That’s what the Community Food Series is about." Over a feast of pupusas, participants were treated to a cooking demonstration of the Salvadoran specialty by Mildred Alvarado of University of Massachusetts Amherst Ethnic Crops Program, followed by a discussion led by Community Servings nutritionist Meghan Ostrander. Much like Patel and Alvarado, she believes that better health can be found through the embracement of traditional cooking at home. The Community Food Workshop Series are an opportunity for discussion about food system issues relating directly to East Boston and provide opportunities for participants to get involved in urban gardening and public health initiatives. The series is sponsored by Healthy on the Block/Saludable en tu Tienda, an East Boston Neighborhood Health Center and Boston Public Health Commission initiative to increase access to fresh produce and whole grains in corner stores. The next workshop, happening on Thursday, April 21, will be centered on “Food Justice 101”, and will feature the youth-led E3C crew (Environmental Chelsea Creek Crew) from NOAH. A gardener-led “Container Planting” workshop will be happening on May 3. For more information regarding the Healthy on the Block/Saludable en tu tienda project or the Community Food Workshop Series, contact Cait Van Damm at 617-568-4028 or vandammc@ebnhc.org. Source of this information: Email from Cait Van Damm (April 11, 2011). On Thursday March 31, 2011 East Boston Main Streets held elections and added 5 new volunteer board members. (East Boston, MA. 31-March-2011) East Boston Main Streets held elections on Thursday March 31, 2011 and added 5 new volunteer board members. Joining the board is resident and local realtor Phillip Gutowski, resident and the Director of Government and Community Affairs for Trans Metro Media, David Halbert, resident and Linguistic Specialist Marika Horsky, resident and owner of Tummy Toys, Melissa Tyler and last but certainly not least Mr. Albert” Buddy” Mangini who is a long-time fixture and active volunteer in East Boston. Three current members were reelected to the board; Dino Manca from Rapinos Memorial Home, Michael Moscone, Promotion Committee Chair, from East Boston Savings Bank and James Gleason, local resident, architect and Design Committee Chair. Stir a memory, a food memory that is! EAST BOSTON: When did you devour your first pupusa? Whether it was last week or on your third birthday, the leaders of the Community Food Workshop Series want to know. Following up last month’s successful “Power of Local” workshop, this month’s theme will turn towards how food affects our emotion and health. The “Stir a Memory” workshop, happening Thursday, April 7 at the Harborside Adult Education Center, will include a “food memory postcard” making activity and a healthy pupusa cooking demonstration – and of course, lots of pupusa eating! Held on the first Thursday night of each month at Harborside Adult Education Center, the Community Food Workshop Series are an opportunity for discussion about food system issues relating directly to East Boston and will provide opportunities for participants to get involved in urban gardening and public health initiatives. Future topics include “Food Justice 101”, and “Container Gardening”. The series is sponsored by Healthy on the Block/Saludable en tu T tienda, an East Boston Neighborhood Health Center and Boston Public Health Commission initiative to increase access to fresh produce and whole grains in corner stores. For more information regarding the Healthy on the Block/Saludable en tu tienda project or the Community Food Workshop Series, contact Cait Van Damm at 617-568-4028 or vandammc@ebnhc.org. • April 7 – Stir a Memory: explore the artistic and emotional connection between culture, health, and food! Local artist Krina Patel will be facilitating a public recipe art project. Cooking demonstrations and games will also add to the fun! • April 21 - Food Justice 101 and more: explore how different social circumstances often dictate health through food, and fun ways to help fix this problem! • May 5 – Container Gardening and Seed Starting! : community leaders will delve into the basics of how to get growing in your own backyard and provide a source of food, community, health and fun! East Boston High School to hold annual fundraiser and gala, April 29. Would you like the chance to win $10,000? Learn how. In keeping with that mission, the East Boston Post of ITAM will be holding a motorcycle bike rally on Saturday, April 23 for Cpl Vincent Mannion -Brodeur who was disabled in Iraq in 2007. More at eastboston.com. East Boston Kiwanis plans a clean-up day at Belle Isle Marsh on April 2. Move that car on Wednesday! The City of Boston will conduct mechanical street sweeping on many of the Eagle Hill streets on Wednesday, March 16. This is an effort to remove much of the debris that have accumulated under vehicles during the Winter months as we await the onset of our regular posted street sweeping program which begins April 1. Read more at Eastboston.com. CORRECTION THIS IS A BOOK DISCUSSION. THE HISTORIAN WILL NOT APPEAR. 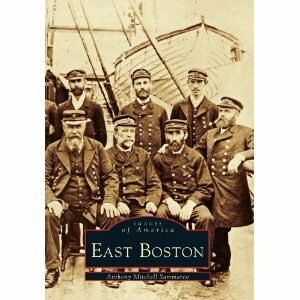 Book discussion on the works of the noted historian, Oscar Handlin and immigration at the East Boston Branch of the Public Library on Monday, April 4. 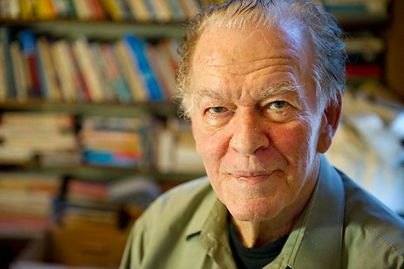 Reason Magazine, the libertarian monthly and website, interviews democracy activist and theoretician Gene Sharp of East Boston. Main Streets to hold its board of directors elections on March 31. The time to register for the East Boston Tee Ball League has arrived. The league welcomes all players from all communities! Bennington Street (Orient Heights) from 6 pm to 8 pm. More information is available at www.eastbostonteeball.com. The East Boston Land Use Council will hold a meeting next week that will announce the application process for for the Leonard Florence Grant Program. Community Food Workshops kick off growing season in Eastie! EAST BOSTON: Aching for a summer tomato and a friendly farmers’ market sort of conversation? A series of workshops focused on East Boston’s community involvement with local food and related health issues might do the trick! Held on the first Thursday night of each month at Harborside Adult Education Center, the Community Food Workshop Series will be an opportunity for discussion about food system issues relating directly to East Boston and will provide opportunities for participants to get involved in urban gardening and public health initiatives. Topics include “The Power of Local”, “Food Justice 101”, and “Container Gardening”. The series is sponsored by Healthy on the Block/Saludable en tu tienda, an East Boston Neighborhood Health Center and Boston Public Health Commission initiative to increase access to fresh produce and whole grains in corner stores. For more information regarding the Healthy on the Block/Saludable en tu tienda project or the Community Food Workshop Series, contact Cait Van Damm at 617-568-4028 or vandammc@ebnhc.org. • March 3 – The Power of Local: East Boston fair food advocates will discuss the global and local food systems, explain why local gives us more options and is better for our community, and share ways you can get involved in their diverse projects. • Food Justice 101 and more: explore how different social circumstances often dictate health through food, and fun ways to help fix this problem! • April 25 – Container Gardening and Seed Starting! : community leaders will delve into the basics of how to get growing in your own backyard and provide a source of food, community, health and fun! Saturday March 5th, 2011 9am - 1pm Harvard School of Dental Medicine. Call: 857-209-4963 or email: gkas.harvard@gmail.com. ABCD: Fight the Obama fuel aid cuts now! Call the White House! "The Obama Administration has proposed devastating cuts and changes to Community Action. Anti-poverty agencies nationwide will be hit hard if these changes go through. More important, critical services for low-income families will be lost." Call the White House today 1-202-456-1111. (East Boston, MA. 12-February-2011- EBMainstreets) On Saturday February 12th the owners of Hong Kong Harbor Chinese Restaurant welcomed in the year of the rabbit. The annual celebration is an important event on the Chinese calendar. Read more at eastboston.com. Labels: Chinese New Year, East Boston, East Boston News, Hong Kong Harbor restaurant, Mainstreets. Pioneer Institute invites you to enter its 20th annual Better Government Competition (BGC). This year's competition is focused exclusively on the issue of budget-busters - those programs that are growing unsustainably and in need of dramatic change. We believe that this is the central issue, at present, for state and local governments as they struggle with lower tax revenue and built-in structural costs, and adopt new accounting standards that require them to declare and fund liabilities for health care and pensions. Pioneer seeks entries from concerned citizens, businesses, public policy makers, and academics, anyone who wants a chance to help state and local government weather the current fiscal crisis and emerge with a more effective overall budget strategy. Submitters to the competition are asked to describe proven programs that have recently delivered measurable benefits, or draft innovative ideas to reform existing budgetary policy. The winning entrant will receive a $10,000 prize and each runner-up will receive a $1000 prize. The BGC Awards Dinner, to be held in June, will announce the winners and celebrate their efforts. To learn more about the Better Government Competition, please visit: http://www.pioneerinstitute.org/programs_bgc.php. You can reach Shawni Littlehale slittlehale@pioneerinstitute.org, or by calling 617-723-2277 x 207. (BOSTON - February 4, 2011) Residents are reminded to adhere to Temporary Parking Restrictions and avoid parking in areas that could impede traffic flow. Boston Public Works, Transportation and Police continue to conduct Emergency Snow Removal activities throughout the city today and through the weekend. The next Eagle Hill Civic Association (EHCA) meeting will be this Wednesday, January 26th from 7:00PM to 8:00PM at the High School. The Eagle Hill Problem Property Task Force (PPTF) will hold its first meeting of the year from 6:00PM to 7:00PM also at the High School. The meeting will probably be in the library if it is available. The PPTF was created by City Councilor Sal LaMattina and holds meetings every other month with police, Inspectional Services Department, Neighborhood Services, and other relevant agencies attending. Residents can bring up a specific problem with a property in the neighborhood (trash, noise, crime, lack of maintenance, etc) and the assembled team of City officials can take appropriate action to address the problem. Please attend if you have a specific property to discuss. 1.) NOAH will present on the "Renew Boston" Energy Efficiency program that allows residents a free energy audit and up to $3,500 in air sealing and weatherization funding. Not to mention that it will help you immediately reduce your heating bills! a. 414 Meridian Street. Owner Richard Cifuni has submitted a petition to construct addition and add an additional story to 8 unit dwelling. No additional units are proposed. b. 169 Princeton Street. Owner Ana Sarnaglia has submitted a petition to extend living space into the basement to add additional floor space to 1st Unit of 3 family dwelling. No additional units are proposed. East Boston Branch Library to discuss Zadie Smith's "On Beauty"
The East Boston branch Library will hold a book discussion group on Zadie Smith's On Beauty on Monday, February 7th at 6:30 until 7:30. If you are need a copy of this book title please feel to go to the library of call (617) 569-0271. EBBPL looks forward to your attendance and being part of the conversation with patrons. With a forecast expected to dump heavy snow during tomorrow morning’s commute Mayor Thomas M. Menino has announced that a Snow Emergency and parking ban for the City of Boston will go into effect tonight at 9 PM and Boston Public Schools will be cancelled on Friday, January 21st. According to the National Weather Service, the City of Boston and surrounding areas could receive between 5 to 10 inches of snow at an average of two inches per hour between 7:00 AM and 10:00 AM. The City of Boston is expecting a significant drop in temperatures immediately following the snow fall as well as additional snow early next week and must clear roadways to provide wider access on all streets throughout next week. Mayor Menino has directed all City of Boston employees to take their time coming into work tomorrow morning and has asked businesses to do the same as the heaviest snowfall is expected during the morning commute. The Mayor reminds people that if they must travel into the city to take public transportation. District 1 City Councilor Sal LaMattina was named Vice President of the Council last week by President Stephen Murphy, a move that recognizes the hard work and collaboration that have characterized LaMattina’s time as a councilor. LaMattina was also appointed to six standing committees of the Council, including the City, Neighborhood Services & Veterans Affairs Committee, which he will chair for a second consecutive term. LaMattina will also serve on committees that oversee city policy on Economic Development & Planning, Education, Environment & Health, Rules & Administration, and Ways & Means. LaMattina has represented the neighborhoods of District 1 – Charlestown, the North End, East Boston and downtown – since the summer of 2006. He is a native of East Boston. Source: Office of City Councilor Sal Lamattina (District 1). According to Massport's Office of Government and Community Affairs, Piers Park will be closed. "Due to the heavy ice and cold temperatures, Massport has closed Piers Park as a temporary safety precaution. Massport personnel are working to de-ice the walk ways throughout the park. Once our personnel feel that it is safe to ‘walk-around’, the park will reopen. We hope to have the park opened shortly depending on the weather." Senator Anthony Petruccelli (D-Boston) joined with several of his Senate colleagues in asking the Massachusetts Parole Board to place a moratorium on all future parole hearings until a full, comprehensive review of the Board’s policies and procedures could be conducted. In a letter to Parole Board Chairman Mark Conrad, Senator Petruccelli and his colleagues urge Mr. Conrad to halt all scheduled hearings in light of the tragic shooting death of Woburn Police Officer John Maguire. The letter, a bi-partisan effort aimed at ensuring the safety and security of the residents of the Commonwealth, was mailed on January 6, 2011. The Senators are currently awaiting a response. 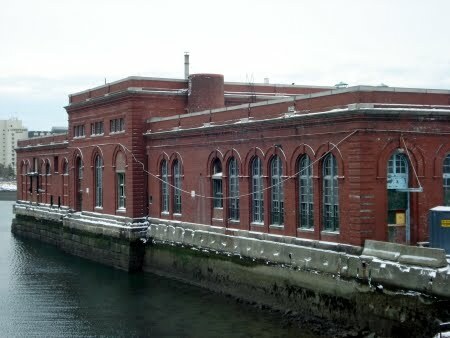 Two surplus MWRA buildings in East Boston, along Chelsea Creek, will be auctioned off later this month. What will be the land use implications? Will a designated commercial, industrial or airport-related use increase truck traffic? How much tax revenue will a refurbished property generate for the City of Boston All good questions. City of Boston's Transportation Department to hold Jan. 19 meeting on the redesign of East Boston's Central Square. Read more at eastboston.com.